Michael Asmar of Jackson's-Winkeljohn's MMA faces Adam Vigil of Colorado's 719 Fight Team on Proteges II Saturday night at the Crowne Plaza Hotel. The weigh-in the Jackson’s MMA Series Protégés 2 was held this afternoon at the Crowne Plaza Hotel in Albuquerque, New Mexico. 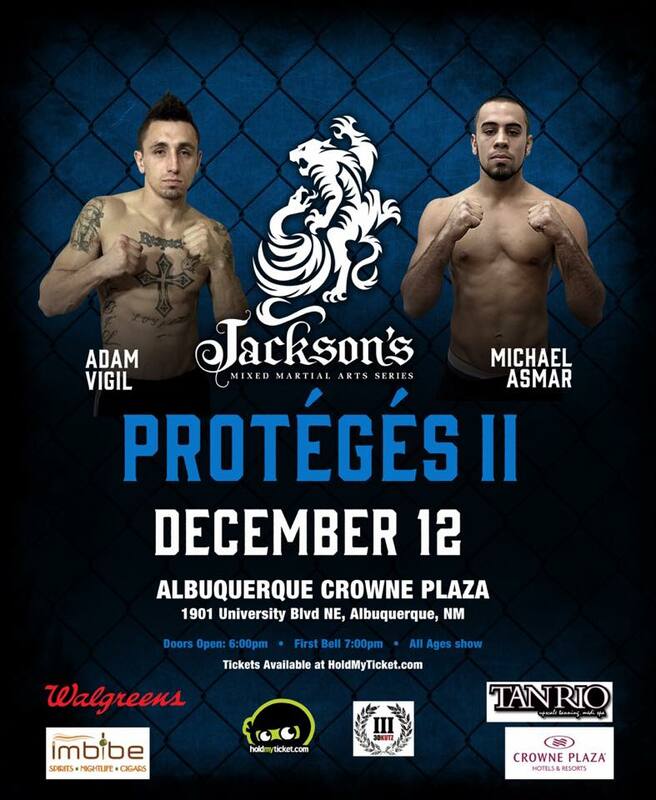 The second installment of Jackson’s MMA Series’ all amateur card features an intriguing main event between Jackson’s-Winkeljohn’s MMA’s Michael Asmar (2-1) against a very experienced Adam Vigil (9-4-1), fighting out of 719 Fight Team in Colorado Springs, Colorado. Tickets to Friday night’s fights which take place at the Crowne Plaza are still available and can be purchased at on HoldMyTicket.com or by clicking HERE.